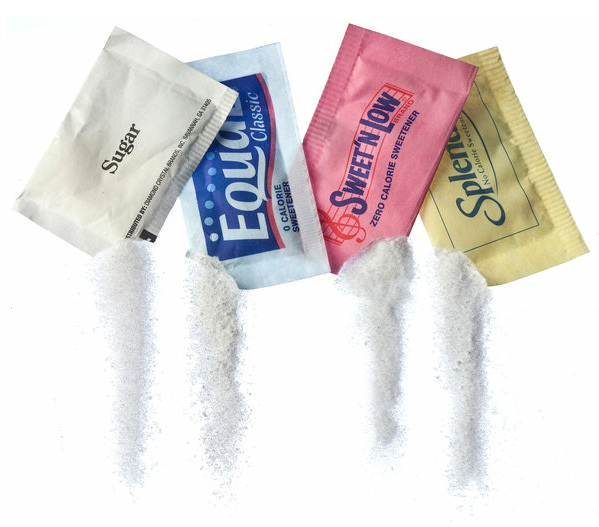 On restaurant tables everywhere, the colors of the sweetener packets instantly identify the contents. Reaching for one to pour into a cup of coffee or tea can sometimes feel like sweetener roulette, with the swirl of confusing, conflicting assertions about which are safe and which are not. Alissa Kaplan Michaels, for one, never picks pink. She still associates saccharin with cancer. The Food and Drug Administration sought to ban it in the 1970s, because rats that gorged on the chemical developed bladder cancer. But Congress imposed a moratorium to delay the ban, and the pink packets of Sweet’N Low remained on restaurant tables. The F.D.A. withdrew its ban proposal in 1991, and the warnings were taken off saccharin in 2000 after research showed that it acts differently in rats and humans, and no conclusive increase in cancers was observed in people. Ms. Michaels, a public relations consultant in New York, knows this. Although many people have nagging worries about artificial sweeteners, they still use mountains of them — globally, artificial sweeteners are a $1.5-billion-a-year market — to avoid sugar and calories. The scientific world is also a dichotomy of conclusions. For any of the sweeteners, one can as easily find a study that offers reassuring analysis of safety as one that enumerates potential alarming effects. And it is possible that there could be long-term effects in humans that will become evident only after people have been consuming these sweeteners for decades. Thus hearsay, mythology and whim guide the choices of many people. For Ms. Michaels, childhood impressions trump absolution from the F.D.A. She even carries in her purse packets of her sweetener of choice — sucralose, sold as Splenda — for those occasions when a restaurant has run out of it and she might otherwise confront a choice between pink and blue. “I’m a yellow girl,” she said. Hundreds of millions of people swallow food and drinks containing artificial sweeteners, and so far, no widespread calamities of health have swept over them. The F.D.A. places the three main artificial sweeteners available today in the same category: “generally recognized as safe.” The manufacturers cite multitudes of health studies to back up that assertion. Part of Dr. Williams’s confidence about safety is that the artificial sweeteners are much more intensely sweet than sugar, so people consume very little of them. Most of the white stuff in the packets is filler, not sweetener. Safety tests in animals looked at doses that were hundreds or thousands of times higher. But critics — particularly of aspartame, sold as Equal or NutraSweet — say that health problems like headaches, neurological disorders and cancers are occurring, but that regulators are ignoring them. The Center for Science in the Public Interest, a health advocacy group, slaps an “avoid” label on saccharin and aspartame, but deems sucralose and neotame — a newer, more intense sweetener that is chemically similar to aspartame — to be safe. The center also warns against acesulfame potassium, a less common sweetener that is rarely found in tabletop packets but is combined with other sweeteners in soda and baked goods for a more sugarlike taste. Dr. Williams’s favorite soda, Fresca, for example, is sweetened with acesulfame potassium and aspartame, as are Halls sugar-free cough drops. A Google search instantly turns up worries that many have about the various sweeteners: Does NutraSweet cause brain cancer? Is Splenda really in the same chemical family as DDT? What about the studies that suggest that artificial sweeteners, despite their dearth of calories, cause weight gain? The concerns arise over what happens to the artificial sweeteners after they are swallowed. Consider aspartame. It is essentially two amino acids and a molecular snippet known as a methyl ester. Certain people — about 1 in 25,000 in the United States — have a genetic condition that prevents them from metabolizing one of the amino acids, phenylalanine, and those people are warned away from aspartame. Others look at the same components of aspartame and see poisons. The two amino acids, while essential for the human diet, cause problems when present out of balance, they say. The third part, the methyl ester, turns into methanol, which is a poison — though fruit juices have higher concentrations of methanol. Woodrow C. Monte, emeritus professor of nutrition at the University of Arizona, ascribes a host of ills, including multiple sclerosis, to low-level methanol poisoning. The scientific literature contains findings that can alarm or reassure. A huge study at a cancer research institute in Italy found that rats given aspartame had higher rates of leukemia and lymphomas. The National Cancer Institute in Maryland, however, reviewed health data from a half a million retirees and found no correlation between beverages with aspartame and these cancers. Meanwhile, sucralose, as the Splenda manufacturer, McNeil Nutritionals, notes in its advertising, starts out as sugar. Chemical reactions excise bits of the sugar molecules and replace them with chlorine atoms. The chlorine effectively camouflages the molecules, and most pass through the body undigested. Hence, zero calories. But some wonder if the chlorine in the sucralose molecules that are absorbed by the body might cause a problem. Michael F. Jacobson, the executive director of the Center for Science in the Public Interest, said the animal testing of sucralose was sufficient for a “safe” rating. The durability of sucralose molecules gives rise to a different concern. Measurable levels of sucralose have been found in the water supply, raising questions about what happens to various animals when they consume it. With the questions about artificial sweeteners, some may even wonder: How bad is sugar, anyway? White sugar offers the purest taste of sweetness. It is natural. But its deleterious health effects are the best established: It can make you fatter. Research published last year that analyzed health data on more than 100,000 nurses in the United States over nearly a quarter-century found a strong correlation between weight gain and consumption of sugar-sweetened beverages and desserts. There was no weight gain for those who drank beverages with artificial sweeteners. Obesity leads to numerous health problems — diabetes, heart disease, even cancer. Sugary drinks like soda (fruit juices, too) particularly contribute to weight gain. Usually, if the diet changes, hunger signals adjust to ensure proper nutrition. But the human digestive system seems to overlook liquid calories. Someone who drinks the 140 calories in a 12-ounce can of Coke will not subconsciously eliminate 140 calories elsewhere in the diet. In terms of relative risk — the known dangers of sugar and weight gain versus the uncertainties of artificial sweeteners — “artificially sweetened beverages are much less bad than the full-sugar beverages,” Dr. Willett said. Still, diet sodas are less than optimal. “I view them like a nicotine patch,” he said. The better solution to protect health: Eat and drink less sweet stuff.